Meet our team! Dennis J. Zisa & Associates, real estate agents, consultants, and property managers. 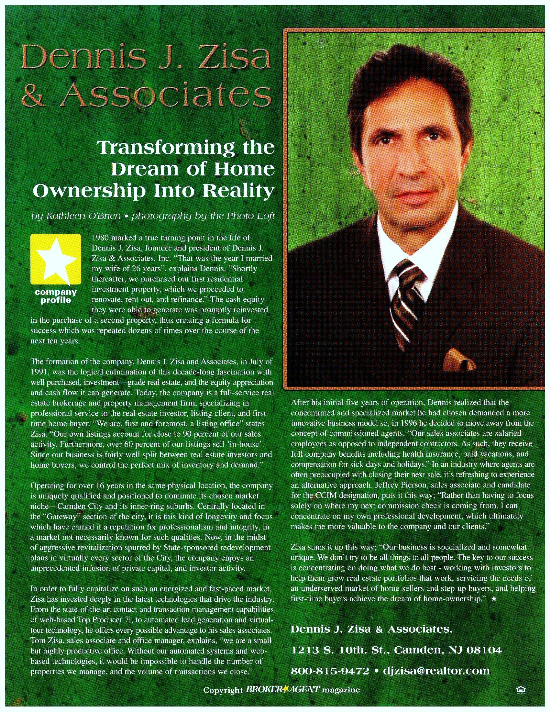 Dennis J. Zisa & Associates was incorporated in July of 1991 by it's founder and current president, as the logical culmination of his decade-long fascination with well-purchased, investment-grade real estate, and the equity appreciation and cash flow it can generate. Today, the company is a full-service real estate brokerage and property management firm, specializing in professional service to the real estate investor, listing client, and first-time home buyer. "We are, first and foremost, a listing office" states Zisa. "Our own listings account for close to 75 percent of our sales activity. Furthermore, over 60 percent of our listings sell "in-house." Since our business is fairly well split between real estate investors and home buyers, we control the perfect mix of inventory and demand. "Operating for over 25 years in the same physical location, the company is uniquely qualified and positioned to dominate its chosen market niche- Camden City and its inner-ring suburbs. Centrally located in the "Gateway" section of the city, it is this kind of longevity and focus which have earned it a reputation for professionalism and integrity, in a market not necessarily known for such qualities. Now, in the midst of aggressive revitalization spurred by State-sponsored redevelopment plans in virtually every sector of the city, the company enjoys an unprecedented infusion of private capital, and investor activity. In order to fully capitalize on such an energized and fast-paced market, Zisa has invested deeply in the latest technologies that drive the industry. From state of the art, web-based contact and transaction management software, to automated lead generation and virtual tour technology, he offers every possible advantage to his sales associates and clients. Zisa sums it up this way; "Our business is specialized and somewhat unique. We don't try to be all things to all people. The key to our success is concentrating on doing what we do best- working with investors to help them grow real estate portfolios that work, servicing the needs of an underserved market of home-sellers and step-up buyers, and helping first-time buyers achieve the dream of home-ownership." It is with great pleasure that I write to you this letter, thanking you for the great service you and your wonderful staff have extended towards me and my family in the selling of my property. 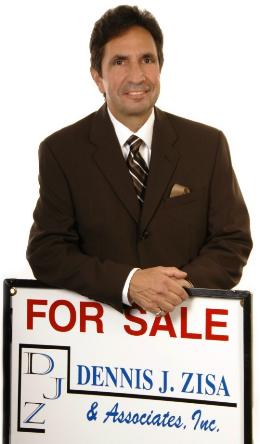 Thank you for your honesty, sincerety and dedication in explaining to me what selling a house is all about. It is companies like yours that will be in the business for along time. I therefore have no reservations in recommending your service to anyone who wishes to do business with you. Thanks so much for all you have done. May God bless you and your associates. I couldn't have done this without the Lord. Also with a little help from you. God knows I appreciate your help. He worked a wonder. I'd like to thank you and your staff for all of the effort you extended to sell my property. It was a pleasure working with you. Thanks again for a job well done.